Pride comes before a fall 🙂 Having boasted about not catching a cold for about 3 years, it was time to show some humility. I caught a cold.. not a nagging, 2-week long one that others had. Mine was just 3-days of suffering in all.. Could it be due to the benefits of yoga & meditation.. when you fall sick, recovery is quicker. Still the cold did not feel pleasant, all stuffy and tired.. I couldn’t do much. With a teaching job, I also couldn’t speak so had to b orrow a mike. My friend made some awesome Chinese tea that I really loved. It has a mystery ingredient that helps relieve colds. When she brought me the mystery fruit from her special market, I rightaway made a huge pot of tea and kept sipping all day at work. My throat felt better, it was like a soft massage to my throat. Hope you enjoy this too. • Soak almonds in hot water and peel. Set aside. • Sip all day long. • Hint: since the herbs and spices sit soaking in water, the tea can get strong through the day. But its caffeine free. Dilute with some fresh water when drinking. Did you like this Chinese cold tea. When you try it, I’d love to hear how it helped your throat. Crunchy roasted channa are my favourite. They are a great street food and you can find them at every corner market in delhi. But I got tired of looking for this Delhi street food classic in grocery stores. 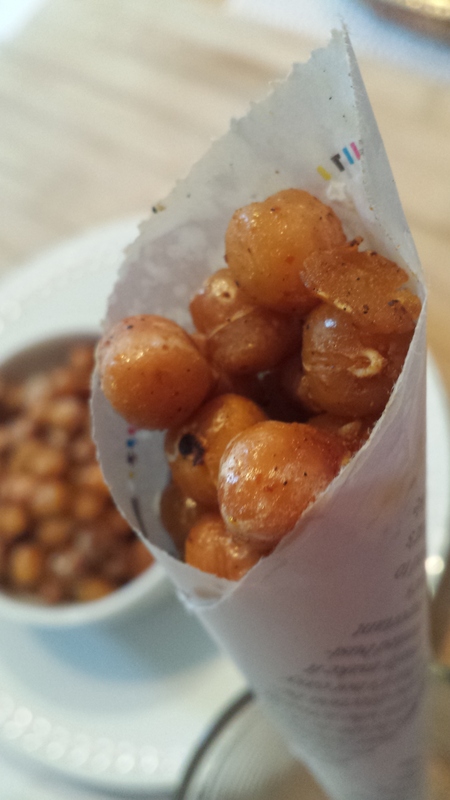 Stores in Canada tend to carry excessively salty & overly spiced roasted channa in packages. So I decided to make my own and was truly surprised by how good home made roasted channa can be. Nothing out of a can, nothing overly oily, or spiced, just hints of spices for an amazing home made snack. 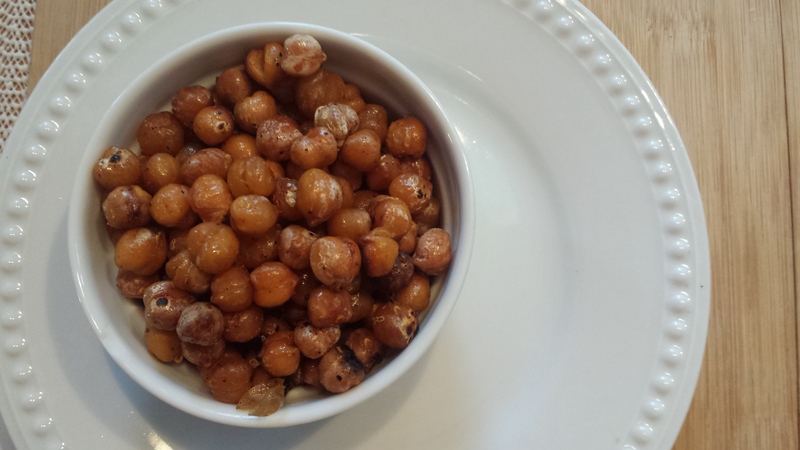 • Wash dry chickpeas thoroughly and soak in fresh water overnight. Next morning, rinse thoroughly and cook till soft. I use a pressure cooker as a great time saver. 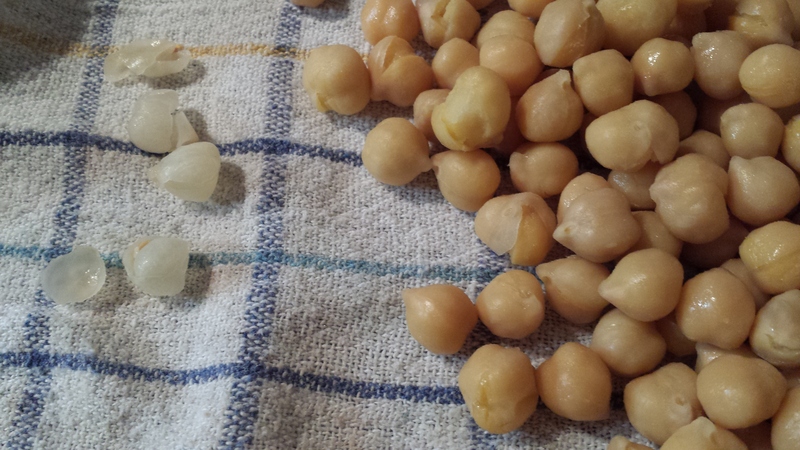 • Meanwhile heat oven to 350 degrees C.
• Wipe down cooked chickpeas thoroughly with a clean kitchen towel..so no trace of outside moisture remains. This is very important to get them crunchy. • Toss in olive oil and let bake for about 20 minutes, turning once. 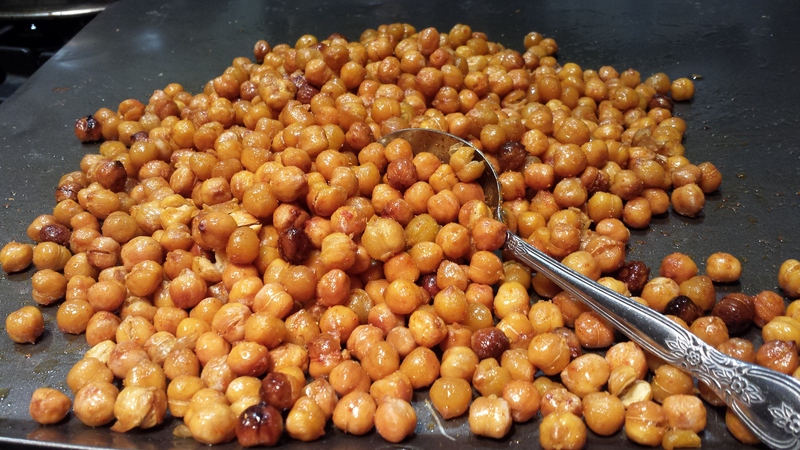 • You’ll know chickpeas are done, when they smell like toasted heaven and coloured light caramel. • Bring out of oven, shake cayenne pepper & salt to coat all over. • Serve up with your favourite beverage, madras coffee is a great complement. Try it by itself, or in salad. 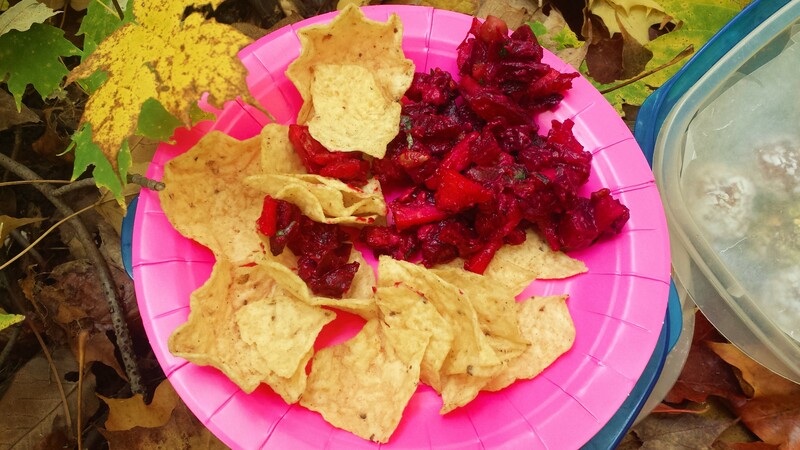 I added them as a topping to ruby jewel beet salad I took for a 15 k hike for my friends who love this salad..
Or sprinkle them in your pastas. like I did for today’s lunch..so many possibilities. Reach for them in the afternoon when your energy levels dip for a healthy & tasty accompaniment to caffeine. Be warned! highly addictive..I polished off the first batch single-handedly in no time. ‘You and I take vegetarian food for granted’, said my friend Connie. She was sharing her experience while helping the native Inuit of Iqaluit. ‘They find the texture of lentils unfamiliar. Its not part of their culture. They are hunters and gatherers’, she said. Connie is right. I’m fortunate I was raised in a country like India. 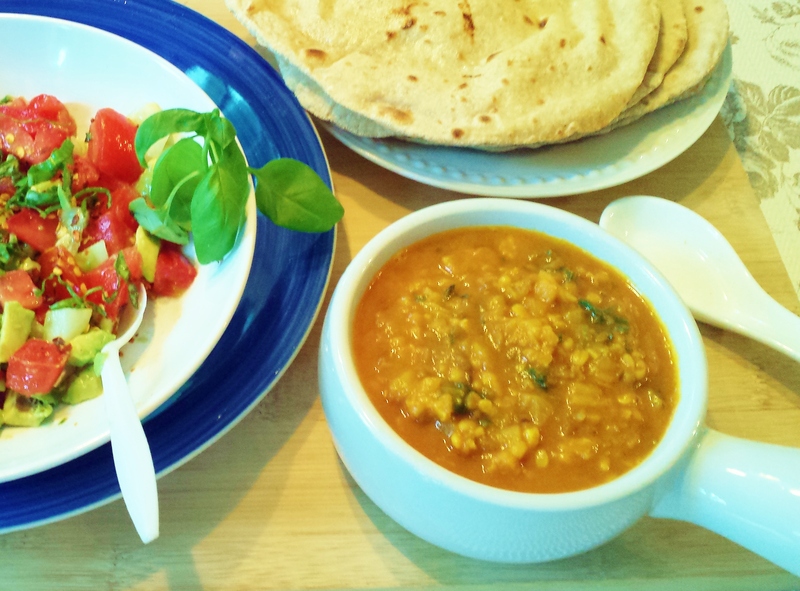 Where Its super easy to prepare light, unprocessed, sustainable recipes. I could easily cook lentils 365 days of the year and not have to repeat a recipe. I really feel for new vegans. Especially those for whom a veg diet is not part of their food culture. 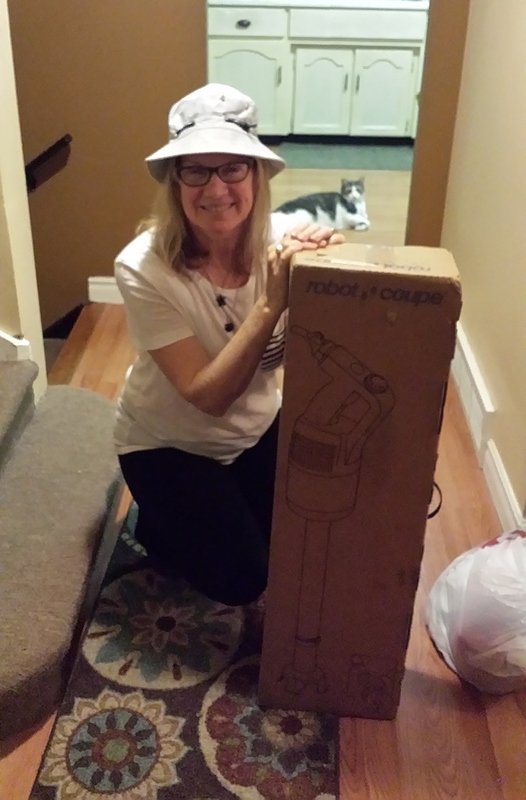 To help the people of Iqaluit, Connie has been fund raising for months. 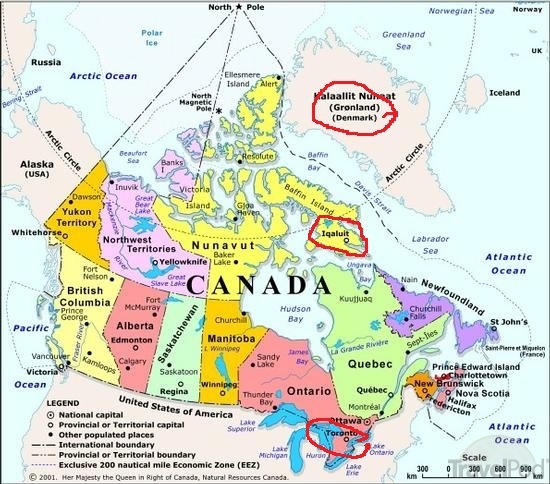 Iqaluit is a northern city closer to Greenland than it is to Ontario where I live. 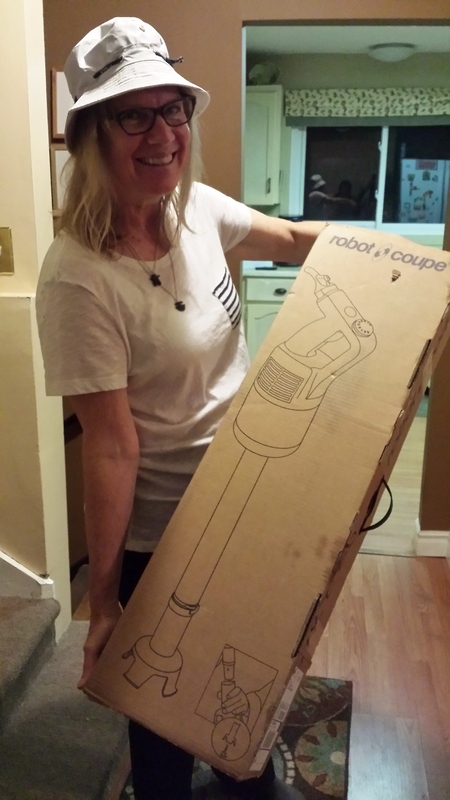 With the funds raised, she bought them this industrial grade food processor to puree their lentils. She’s flown off to Iqualuit to hand this off. So their lentils will be more palatable to their hunter – gatherer state. Wow, look at the size of that..I’m surprised Connie can even hold it up! I promised to write her an easy puree lentil recipe that they could blend in their soup kitchen as they transition from hunter-gatherer to farmer. • Wash mung beans thoroughly. Soak in 1 cup water and cook till soft. • Chop onions, garlic and ginger and tomatoes. Set aside. • Heat coconut oil in pan. Apsara tip – I’m excited & grateful to have a chance to introduce the hunter-gatherer inuit to vegan food.. I’m not sure what oils they have locally available so will leave choice of oil to them and to you. Coconut oil in my humble opinion is great. I believe its best not to judge choice of oil anyone wishes to use., but only point out what is healthy and best for body. • Add cumin seeds, hing and then quickly add onions, garlic and ginger. Saute till cooked and soft. • Add tomatoes and spices and let cook till soft. 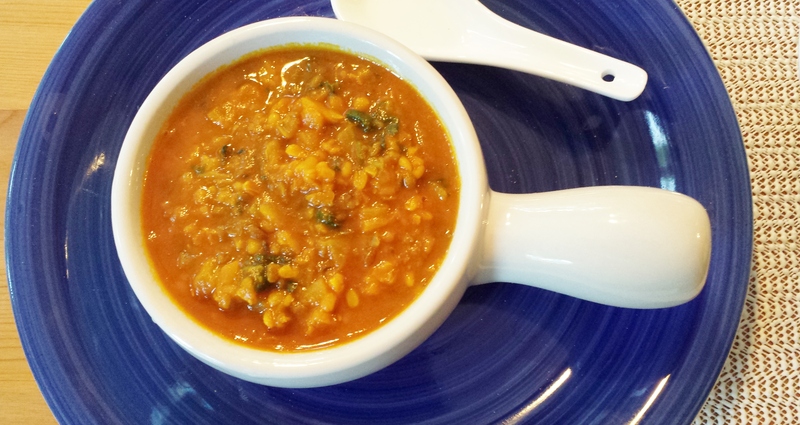 • Add cooked mung beans and ½ cup water. Let come to boil. • Take off stove. Puree the entire soup. Stir in lemon juice and fresh cilantro leaves. 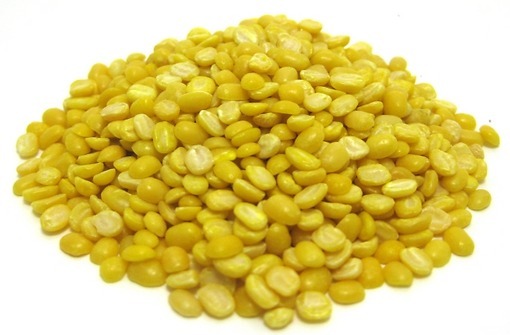 Mung beans are the healthiest beans going around. 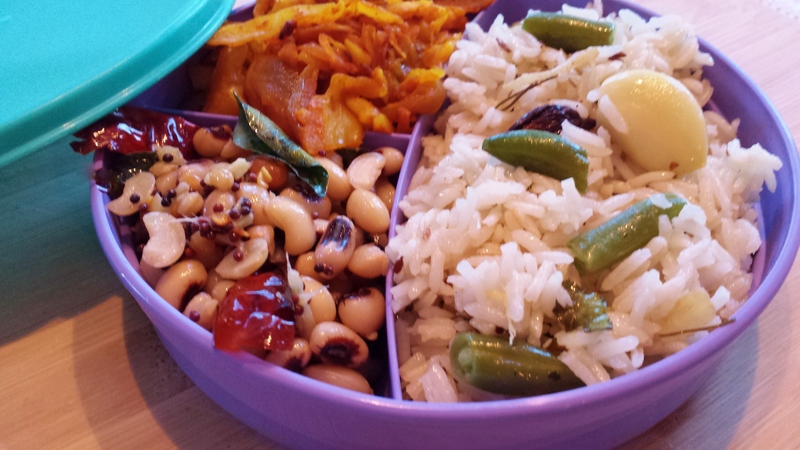 According to Ayurveda, indian system of health, the smaller the beans the easier to digest. Look at Timbit in the kitchen. that’s a quiet cat. First time I’ve seen him stay so quiet. no take that back, he’s quite a zen cat 🙂 look at him watching my yoga class.. 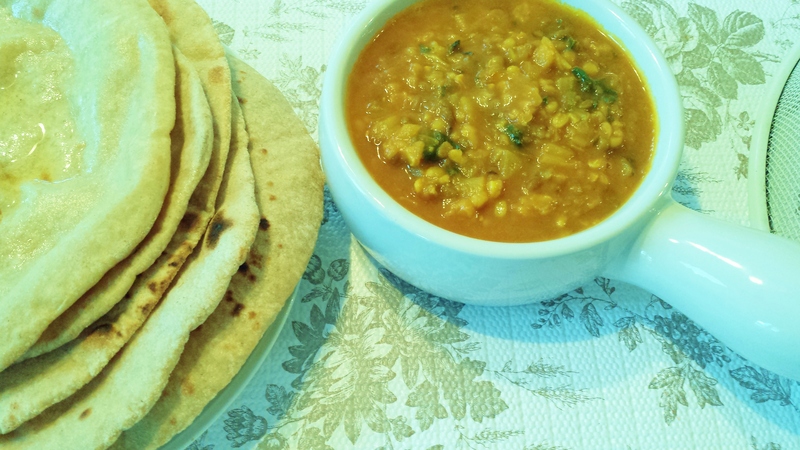 Though the Iqualuit inspired this post, dear reader, anyone who is a new vegan or even a seasoned vegan can easily try my recipe. You will be sure to fall in love with it. Its foolproof and delicious beyond description. ‘Ooh, What’s that appetising smell’?, asked my coworker as she walked into the staff lobby at lunchtime. ‘I knew its your lunch rightaway. What do you have? OMG its so, so fragrant’, she said as she peered into my Tupperware. That’s a pretty awesome segway into today’s women’s day post. My coworker is not alone in loving Indian food. Everyone just loves the special spices that go into Indian food. When its lovingly home cooked, it takes food up a notch. Once you’ve eaten a home cooked Indian meal, life will never be the same again 🙂 There is a lot of magic happening. I’ll try to break it down just a wee bit in my post today. Rasa is juice that appeals to every sense. Really, really top notch Indian vegetarian food takes it one step further. Beyond juice, it uses colour artistically. It layers foods in interesting combinations, never repeating the same flavour twice in a meal. My lunch today that my coworker was raving about WAS juicy. I made garlic cabbage tomato curry, ginger black eyed beans with mustard seeds and shredded coconut. I served it with basmati rice pulao sautéed with green beans and this very special spice.. gives it a smoky flavour. Hint, you can see it in the pix above, in the pulao 🙂 If you guess right, I have a giveaway. 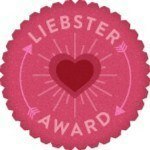 If you live in the Greater Toronto area, I’m giving away a complementary yoga class. Check the side bar for locations. And If you live outside, I will mail you a treat. I received this lovely surprise in the mail. 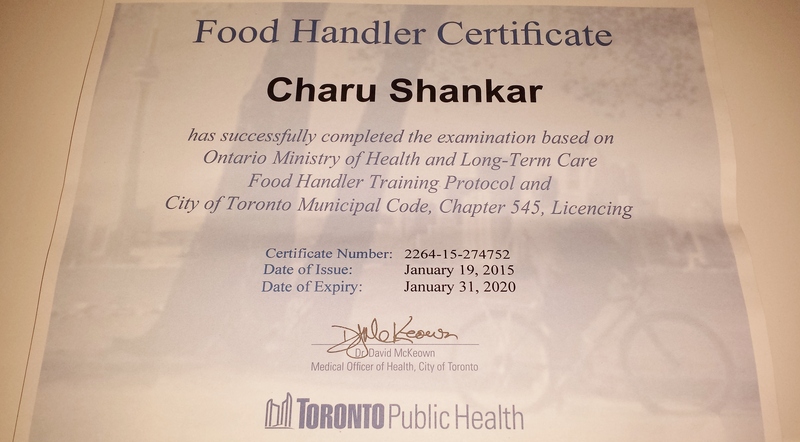 My food handler certificate has arrived. I passed the exam and am now certified. Don’t you like the wording on the letter. I’ve been cooking now for over 30 years. I guess the signs are clear now. Its time to share my knowledge with everyone. I’ve been doing that though my catering to friends and coworkers who simply can’t get enough of the tasty vegetarian/vegan meals I bring them. 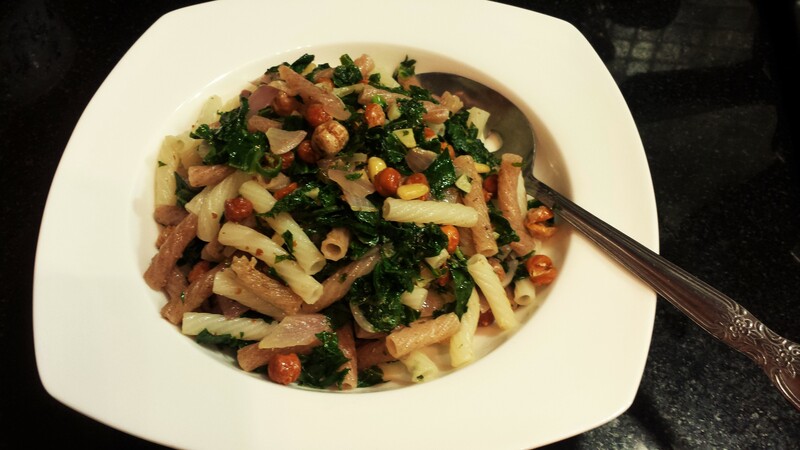 I’ve been blogging about my recipes. Often they are unique as I take ancient secret recipes. Add a modern healthy twist to them. I’ve been asked to teach cooking lessons to american friends. Will do that next. I’m really excited about my food handler certificate. Can’t wait to share my knowledge with you all. Tell, me what would you like to hear more of from me. My grandfather, a village doctor swore by this recipe. Even without a cold, he would get my mom to serve him golden milk every night. The secret to his healthy long life I’m guessing. Meanwhile we thought he just loved milk. In India, traditionally, turmeric milk has been used for colds, congestion, headache, and sore throats. Back to the original friend’s question- Why black pepper and milk with turmeric? Turmeric has a component called curcumin which is fat soluble. Meaning -it dissolves in fat. With No fat, curcumin has a really hard time going further than the stomach, into the small intestine where ultimately it gets absorbed into the blood stream where it has the highest benefits. Ok, what about black pepper? Next spice, Black pepper and its main component piperine. Its similar to capsaicin in chili peppers. 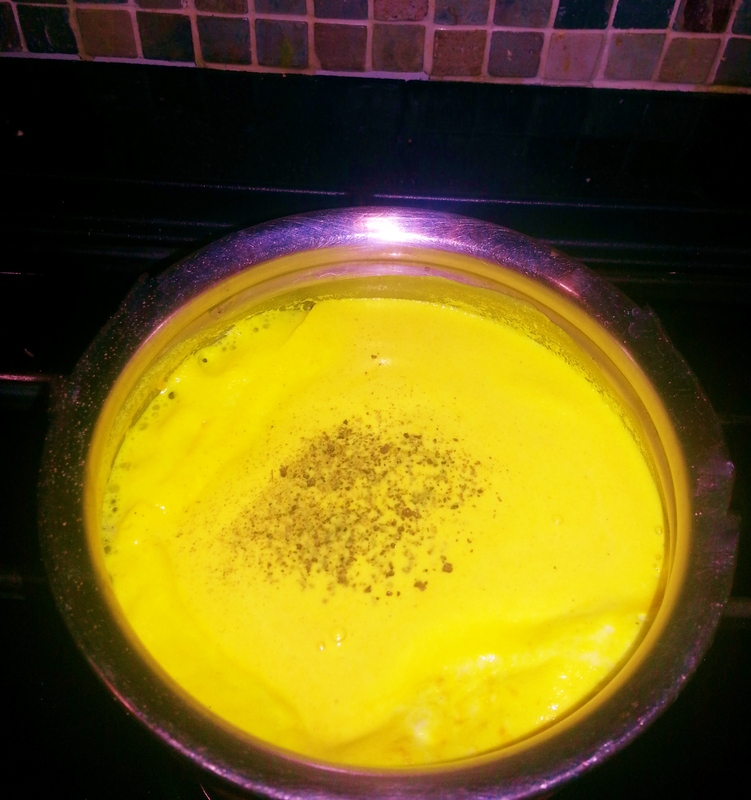 Adding black pepper to turmeric dissolved in milk increases curcumin’s bioavailabilty by 1000 times. Now there’s an interesting statistic to make you want to try this combo of turmeric black pepper in other places & recipes. • Drink hot or warm. Can’t handle spiced milk –just add some honey to sweeten. Boost immune system so you can stay healthy during the cold winter months cooped up indoors. Turmeric milk’s powerful antioxidant properties help promote heart health, memory, and boost the immune system. It has the potential to deliver more antioxidants then even vitamins E and C.
Reduce arthritic pain. Clinically proven to ease arthritic pain and promote increased flexibility in many studies. It’s comparable to large doses of ibuprofen (800 mg daily) without side-effects while actually delivering other health benefits. Fight insomnia. My grandfather’s nightly warm beverage of turmeric milk may have been the reason he slept so well at night. Help your digestive tract – the root of good or bad health. It helps ease and heal inflammatory bowel disease. Slow and help reverse the onset of Alzheimer’s disease as symptoms develop. It also helps eliminate cognitive decline normally attributed to “old age. Get glowing skin. Turmeric milk helps fights free radicals that damage skin and make it lose its glow and elasticity. Turmeric face masks are a great way to get external skin glow, but turmeric milk can help in internal absorption. Meat eaters rejoice.. It reduces carcinogenic heterocyclic amines that are formed when meat is cooked by up to 40 percent. Next time you reach for that turmeric supplement. Stop.. read its ingredients. Does it have the necessary fat to dissolve the curcumin in turmeric, if not, make turmeric paste by dissolving the capsule in 1 tsp coconut oil & then take it. Last word : turmeric has been used in India’s Ayurvedic remedies for 2,500 years. “We’ve shown that [curcumin] has well over 100 mechanisms of damaging cancer cells, particularly colon cancer cells,” said Professor Will Stewart. All these benefits add up to a great anti-aging agent, with direct results showing up in your skin after daily use over an extended period of time. Now you know the secret of my youth and that of millions of indian women 🙂 who use turmeric in their daily cooking. Here’s my backyard. February arrived with a dramatic snowfall! Doesn’t it make you want to just cuddle indoors with a blanket and sip warm beverages. Now, you know how to. So go on, make yourself a nice warm glass of turmeric milk next time you feel under the weather with this wintry snow all around. As you get better, do write to me. Want to know my secret! How to move your digestion & improve elimination. Just back from a yoga retreat vacation. Best way to beat Canadian winter blues is to head south to the atlantic. Nothing like sun, sand and yoga with awesome vegetarian food to warm you up. While at the ashram I had a chance to cook a meal for about 300 guests. Yes!!! That’s right.. never cooked this size before, but managed to with a little bit of help.. recipes from that meal later. All yoga practices ultimately engage the movement of prana—the innate life force. One of the main breaths of yoga is apana vayu—of equal importance in the practice of hatha yoga. apana, which is most active in the pelvis and lower abdomen, governs the eliminative functions (excretion, urination, menstruation) and the downward and outward flow of energy in the body. When this energy of apana is stuck, you end up with that sense of unease, discomfort, nausea even sometimes.. Just because food is sitting away and taking its time to move downwards. So how can you help Apana? I’ll share yoga poses next time. For now think foods that have some fibre. Lettuce was my answer. I’ve always avoided cold salads, warm foods help my body constitution. But I tried eating lettuce every single meal at the yoga retreat and cut back on some of the delicious freshly baked bread. That was soo hard to do. But so well worth the results. Flatter abs, (still some work ahead of me 🙂 fluid movement of food in my body..
Here’s my recipe for a delicious lettuce salad, exciting, never boring. * Boil black eyed peas in water till soft. Drain and set aside. 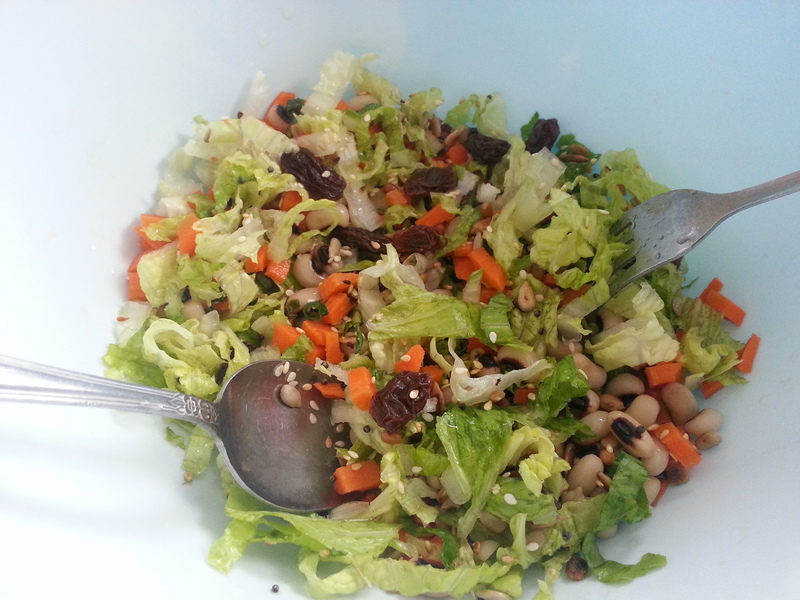 * Mix shredded lettuce and cubed carrots in salad bowl. Add drained black eyed peas to bowl. * Heat coconut oil in pan. 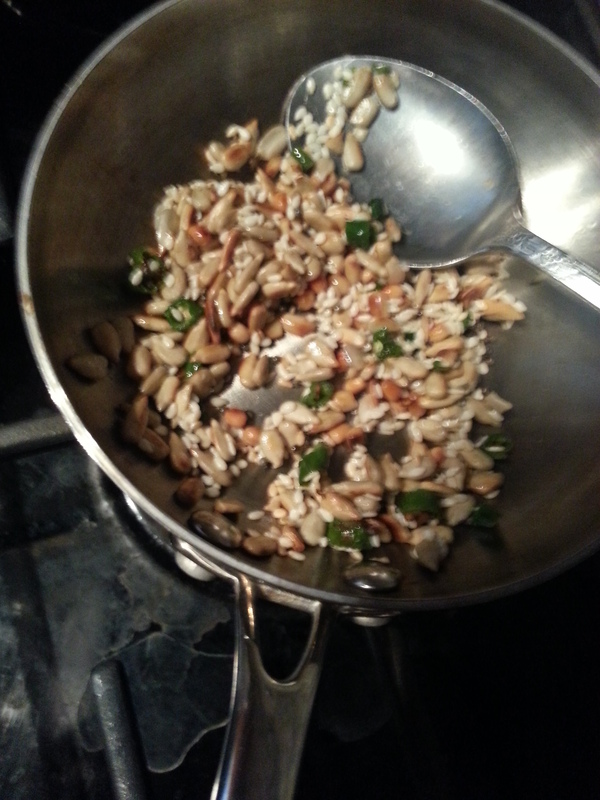 Add mustard seeds, when they splutter, add the rest of the spice mix & stir till golden brown. 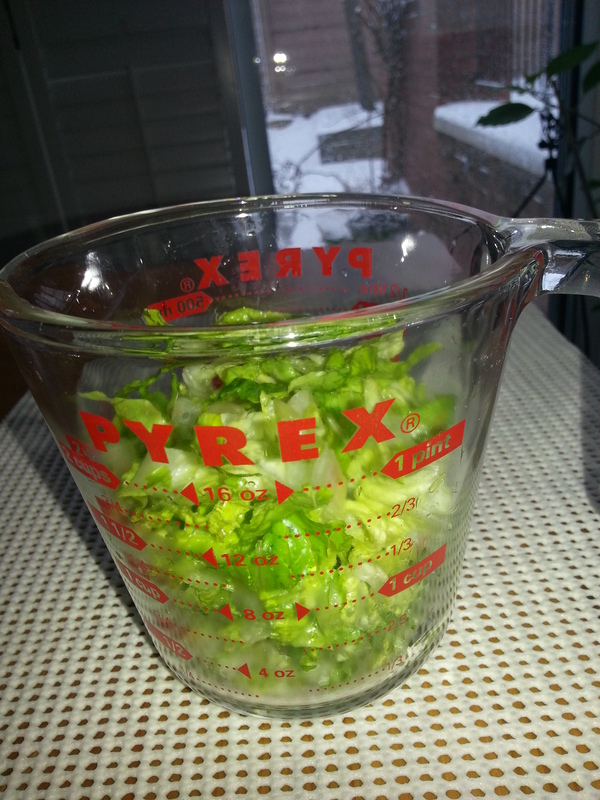 * Pour the spice mix into the salad bowl. * Add salt to taste and mix in lemon juice. Wasn’t that easy? Enjoy this delicious and pretty salad. I’m sure your stomach will thank you for the lovely and light feeling you carry through the day.. with the thoughtful spices that went into this salad. 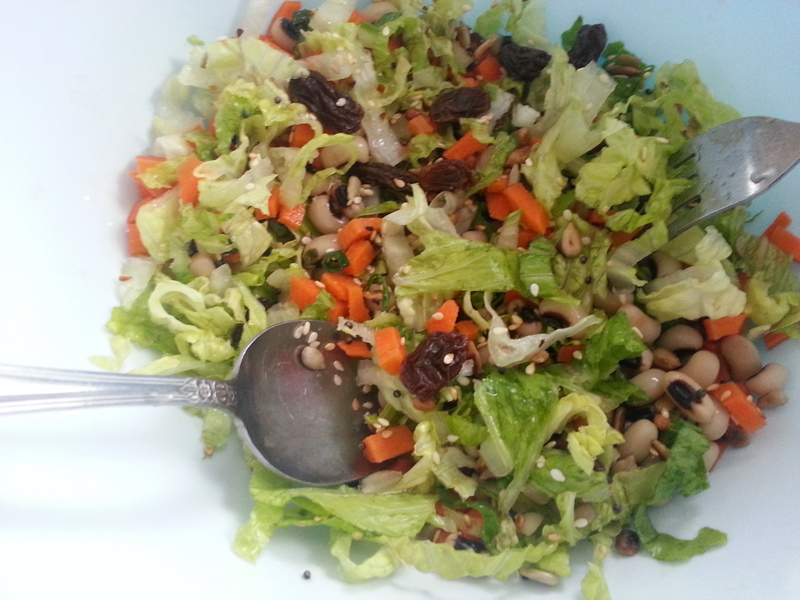 Write in your comments, I’d love to hear how this salad worked for you. 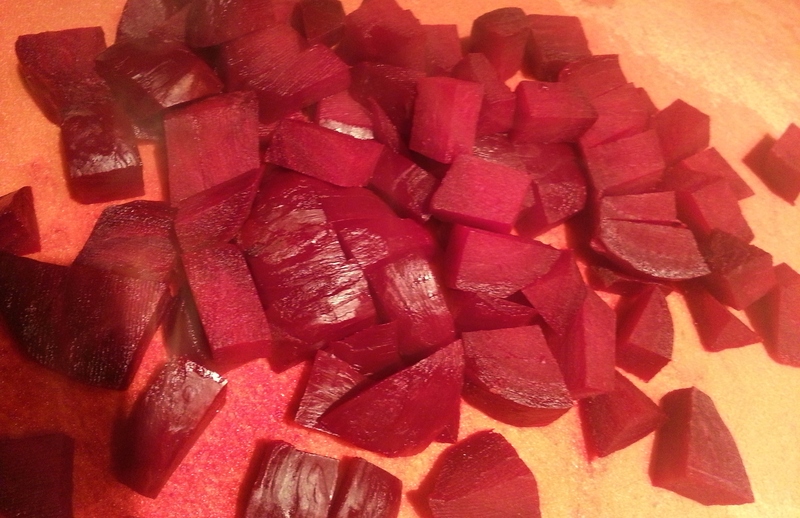 Simple, elegant, tasteful, this way of doing your beets is bound to have you hooked. • Add salt and remove from fire. 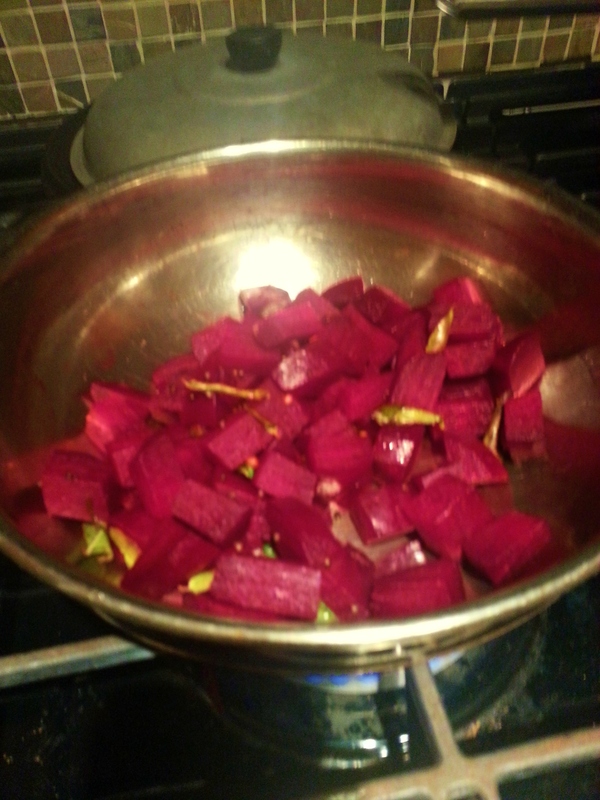 Do try my way of cooking and eating beets? Do let me know if you like them this way.. 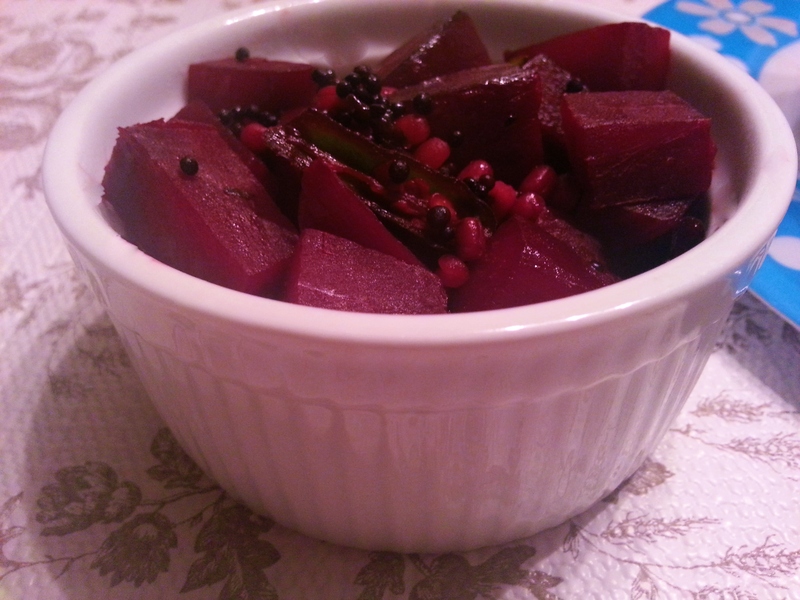 I paired beets with the cold medicine soup, rice and some papad.